This past weekend my blog celebrated its fifth birthday! I can’t believe five years have gone by since I was a 19-year-old kid about to go on summer break before my junior year of college, wanting to do something creative with the outfits I was wearing every day. If you think blogging every day is easy, you’d be wrong. There are some weeks (like this week) when I didn’t have time this past weekend to plan out this week’s posts, so I’ve been working away after work, taking photos, filming videos, editing, etc. Don’t get me wrong; I love it—but it’s a commitment, one that I made to myself five years ago that I’d post every single weekday (minus a few holiday/vacation breaks here and there). Thank YOU for reading my blog and for keeping me motivated to continue to post something every day. If you’ve been with me since the beginning, you’ve got to go through my first summer internship at a publishing house, life in college, graduating college, finding a job (thanks, in big part, to this blog and the social media/management/HTML experience it gave me), moving to Omaha, getting my first apartment, and now living real life as an adult. I really like my small corner of the world wide web, and I hope you do, too. 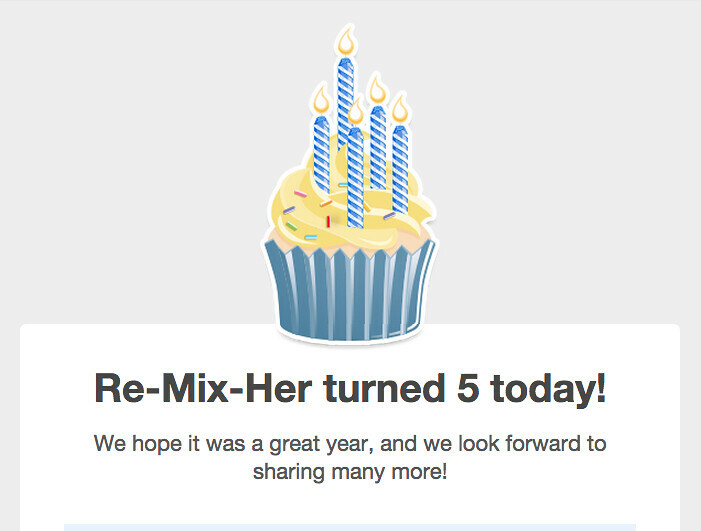 Thanks for supporting Re-Mix-Her—and happy birthday!